This is the first block in a series of 12 that make the Semi-improv 9-patch quilt. 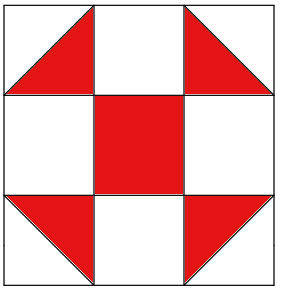 Place both pattern square and background square with right sides together. The first block is done. Show your semi-improv 9-patch quilt pictures at the Semi improv 9-patch quilt tutorial group. Hi, I just wanted to tell you I look forward to everyone of you blocks and ideas…Your awesome and I just wanted to thank you….THANKS!!!!!! I have done my first block. Have a ton of charm squares ao I may as well use them. I’ll post on my blog as well soon. Looking forward the end result!